This lovely and charming old town is just 50 km north of Paris. It falls within the metropolitan area of Paris. Here you can find the peace and quiet of beautiful nature. 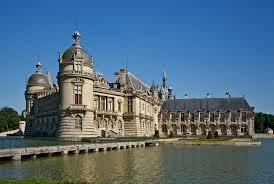 Chantilly is a commune in the Olse department in the Nonette valley in the Picardy region of northern France. 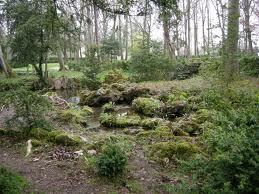 It is surrounded by the Chantilly Forest. 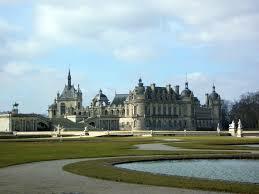 Here you can delight in the Chateau de Chantilly with its wonderful parkland, gardens and forest. 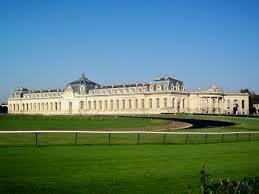 Chantilly boasts of one the most prestigious racetracks in Europe. The delicious and sweet thick cream Chantilly was created here. You will think you have stepped into a fairytale when you visit the Chateau de Chantilly with its storybook setting. The chateau has an impressive collection of paintings in the Musee Conde. It consists of two attached buildings, the Petit and Grand Chateau and on the estate is also the Grand Stables. To see all there is to see about the estate you can take a ride around on a little train or hire four-person golf carts. The Petit Chateaux included the Princes’ Suites and was built about 1560 for Anne de Montmorency. Montmorency served six French kings as high constable, diplomat and warrior. The highlight here is the Cabinet des Livres which is a repository of 700 manuscripts and over 30,000 volumes among them a Gutenberg Bible and a facsimile of the Tres Riches Heures du Duc de Berry an illuminated manuscript that dates back to the 15th century and illustrates the calendar year for both the nobility and the peasantry. The chapel has woodwork and stained-grass windows that date back to the mid-16th century. The Renaissance-style Grand Chateau though demolished during the Revolution was rebuilt by the Duke of Aumale, son of King Louis-Philippe. 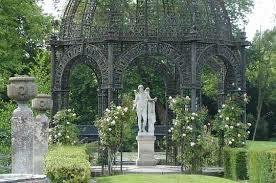 The chateau is home to the Musee Conde that has a series of 19th century room with many paintings and sculptures. The most remarkable artworks here are in the Sanctuary and include paintings by Filippino Lippi, Jean Fouquet and Raphael. The gardens of the chateau are lovely and include the formal French Garden with flowerbeds and a Grand Canal, the English Garden and the Anglo-Chinese Garden. The foliage and waterways of the Anglo-Chinese Garden are surrounded by a mock village dating back to 1774 whose mill and half-timbered buildings inspired the Hameau de la Reine at Versailles. The Grand Stables were built between 1719 and 1740. 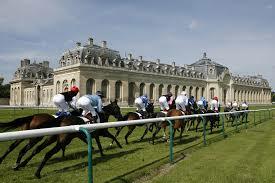 They are home to 240 horses and over 400 hounds, located near Chantilly’s famous racecourse. 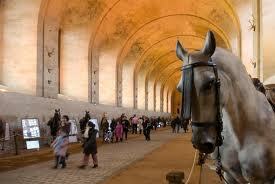 Of particular interest in the stables is The Living Horse Museum of Chantilly. This is not just a stable but could be said to be an equestrian palace designed by Jean Aubert in 1719. The reason for this is that Prince Henri-Louis de Bourbon was convinced that he was going to be reincarnated as a horse so he would need grand stables. The museum is a definite must-see especially for all horse lovers. At the entrance of the Grand Stables thirty horses can be seen in their most luxurious wooden stalls. There are Andalucian and Portuguese horses which are the same kinds of horses that were at the stables in the 18th century and were preferred by the princes of Conde. Other kinds of horses here are Spanish, Thoroughbred and Friesian. Visitors can also delight in some ponies and a most lovable donkey named Seraphin. The museum has 31 rooms which are all dedicated to paintings, sculptures and ceramics all having to do with horses. Visitors are encouraged to observe and interact with these magnificent animals up-close. Twice a day educational dressage demonstrations are given and there is a not-to-be-missed hour-long equestrian show on the first Sunday of each month from February to November held in the Grand Stables Dome. In December and January there is a Christmas equestrian show. 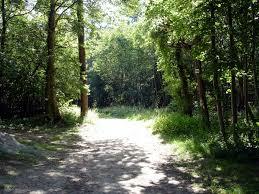 The Foret de Chantily has many walking and riding trails. There are even long-distance trails so if you are into horse riding this is the place for you. The tourist office provides maps and guides. Since you are visiting Chantilly do take the time to visit Parc Asterix. This is a theme amusement park that is based on the stories of Asterix. It is just 20 km from the Chateau de Chantily. It is especially well-known for its variety of roller coasters and has rides and themes that incorporate historic cultures like the Romans, the ancient Greeks and the Egyptians.